Our clients trust Spectrum Dental Laboratory to stay current with new developments and deliver only the best products dentistry has to offer. 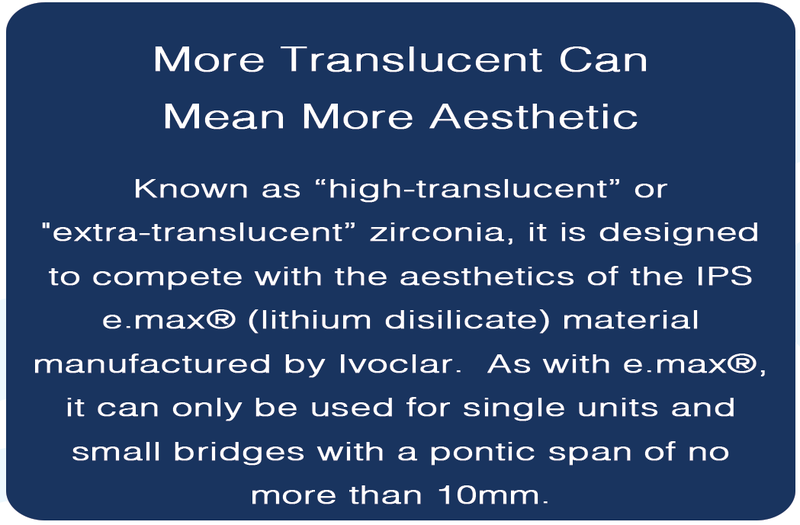 With this in mind Spectrum is introducing a new type of aesthetic Zirconia that is available to you today. We call it our STZ, Spectrum Translucent Zirconia material. As you read through the information here, you will discover how beneficial these recent material developments can be. Use it for a wide range of applications. It looks really good for inlays as well as onlays and full crowns. And it makes a great micro-layered anterior, just the ticket for those times when there is little room for reduction when extra strength is needed. For those heavy bruxers, you may want to continue to use the standard zirconia, but for the bicuspids and areas you where you need a very aesthetic material, the new more translucent zirconia should provide greater aesthetic satisfaction. 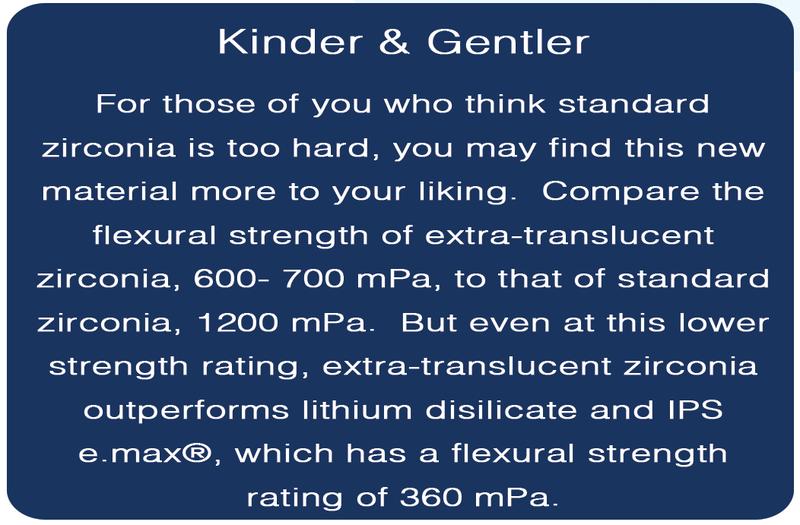 Just like standard zirconia, the new extra translucent zirconia can be conventionally cemented as well as bonded. Zirconia cannot be acid-etched, so areas with very little retention may work best with a bonded type of restoration like e.max®. Minimum occlusal reduction needs to be 1.2mm. Standard zirconia preps can be done with less than 1mm. Most shades can be matched well, however lighter shades seem to work best, as high-translucent zirconia does not seem to accept dark coloring well. Because of its translucent nature it may not block out very dark preparation color, or preparations with posts and core. Fortunately, standard zirconia will do the trick.